Check out the Wall Assembly Guide iPad App at the iTunes store! Since 1918, weâ&#x20AC;&#x2122;ve built our reputa-tion on handling tough, complex projects that require quality work, technical skill, and construction ex-pertise. From healthcare centers to university facilities, you can rest assured that your project will be completed by the finest people in the construction industry. Winter 2016 – IN THIS ISSUE Take a closer look at Philadelphia’s rich architectural past through the lens of mid-century modern masters such as Louis Kahn, Robert Venturi and Denise Scott Brown, and Romaldo Giurgola. Philadelphia’s Everyday Modernism William Whitaker celebrates landmarks of Philadelphia’s “ordinary” modernism–the hamburger joints, shops, TV studios, and motels of our youth. Truly and Unobtrusively Modern: Chestnut Hill Architecture of the Twentieth Century Emily Cooperman puts the landmark houses by Robert Venturi, Louis Kahn, and Romaldo Giurgola in a wider context. Rehabilitating Richards David Hollenberg discusses the daunting challenges of restoring (and adapting for new uses) Louis Kahn’s Richards Medical Research Building at Penn, a National Historic Landmark. 2015 Design Awards Meet the winners of the 2015 Design Awards and view their winning projects. Let Ernst Brothers surpass your expectations for custom craftsmanship and commitment to your vision. I hate the term “Mid-century Modernism.” When was mid century? What is modernism? 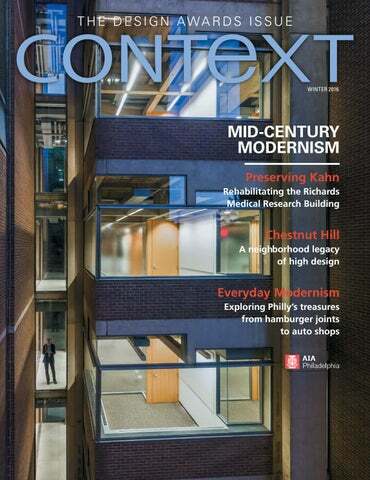 It’s hard to answer those questions, but that difficulty is, in fact, one of the defining characteristics of the fascinating architecture that we explore in this issue of Context. Nowhere is the complicated, hard-to-categorize richness of mid-century architecture more apparent than here in Philadelphia. We’re the home town of the “Philadelphia School,” which Jan Rowan christened and defined (loosely) in a famous article in Progressive Architecture in 1961.1 The Philadelphia School is arguably the quintessential architectural expression of the period, and, fittingly, it’s hard to define. “Complex and contradictory” is one way you could describe the architecture built here in the 1940s, 50s, and 60s. And, indeed, this year is the fiftieth anniversary of Complexity and Contradiction in Architecture, the epochal book written by Robert Venturi, one of Rowan’s Philadelphia Schoolmates, and published by the Museum of Modern Art in 1966. In his “gentle manifesto,” Venturi suggested looking carefully at all sorts of architecture from the past, and then famously ended by declaring that the ordinary architecture of Main Street and of the commercial strip was “almost all right.” Subsequently, when anyone has tried to blame him for inventing Post Modernism, he concedes that “the modern movement was almost all right,” too. What was created during the mid-century years in Philadelphia seems to live up to Venturi’s embracing, tolerant vision. But is it more than just complex and contradictory? What thread can possibly tie together all the inventive architecture that was built in Philadelphia during that era? What connects the comfortable domesticity of the Mother’s House, the romantic San Gimignano allusions of Louis Kahn’s Richards Building, the boney power of Romaldo Giurgola’s Walnut Street Garage, and the slick pizazz of the everyday commercial strip? Those buildings don’t look alike, which is how we normally define architectural styles and epochs. But if you close your eyes for a moment, you can see that, at a time when modern architecture seemed to have stalled and become formulaic, Philadelphia’s architects shared the vision of making it less artificial and more real. They did not agree about how to do it, however. Those who were working with the everyday reality of the suburb and the commercial strip undid some of modernism’s remoteness and abstraction to create a new vernacular architecture. Kahn reattached architecture to history and rooted his designs in the realities of particular traditions, functions, and materials. Giurgola reinvigorated form making with ardent geometry and structural expression. And Venturi and Scott Brown tapped into the “languages” with which ordinary people communicate in architecture. This creative diversity makes Philadelphia’s mid-century architecture a little hard to define, and that may be the reason that we have been slow to appreciate and protect its landmarks. But understanding and appreciation are now growing, as the following articles make plain. ■ David Brownlee teaches architectural history at the University of Pennsylvania 1 Jan C. Rowan, “Wanting To Be: The Philadelphia School,” Progressive Architecture 42 (April 1961): 140-50. 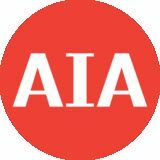 On January 14, 2016 AIA Philadelphia members are invited to celebrate the induction of the newly elected Board of Directors and Officers. Held at The Athenaeum, 219 South 6th Street, Philadelphia, the program includes the presentation of the Thomas U. Walter Award which honors a chapter member for his/her contributions to the architectural community through service to the American Institute of Architects and its initiatives. Join us this Spring for our annual exhibition celebrating the winners of the Philadelphia Emerging Architect (PEA) Prize, awarded to an emerging Philadelphia architecture firm producing innovative design strategies, and the Young Architect Prize, awarded to one or more registered architect members of AIA Philadelphia between the ages of 25 and 39. This year’s exhibition will feature a retrospective of past PEA Prize winners and the 2015 Young Architect honoree, Fon Wang, AIA. Over the course of her 17-year career, Fon has led projects ranging from state-ofthe-art academic facilities to the restoration of a late 19th century station house. 2015 marks the 10th anniversary of The Better Philadelphia Challenge, an annual international design competition, founded in memory Philadelphia’s iconic city planner Edmund N. Bacon, to challenge university-level students to address real-world urban design issues in Philadelphia. To celebrate the milestone, the competition was extended to professional entrants and will offer two $5,000 prizes, one for the top student submission and one for the top professional submission. The 2015 challenge asks entrants to design a healthy and active greater Belmont/Mantua neighborhood. Entries include physical design interventions that address health and activity, at both the grand vision and the small scale. An awards ceremony will be held in February to honor the winners, and will also feature a talk by the 2016 Edmund N. Bacon Prize winner. Congratulations Paul Drzal, AIA, NCARB, Winner of the “Kahn Coffee” Design Competition. As part of this year’s DesignPhiladelphia Festival, CFA hosted the “Kahn Coffee” Design Competition. Launched through a partnership between the Philadelphia Center for Architecture and Philly Fair Trade Roasters, the contest was a branding exercise to design packaging for a new blend of coffee available for purchase at the AIA Bookstore. Entries were on display for voting during the 2015 DesignPhiladelphia Festival. Winning the public voting was the design of a Philadelphia-based architect and photographer, Paul Drzal, AIA, NCARB. Mr. Drzal graduated from Philadelphia University’s NAAB accredited Bachelor of Architecture program in 2002 and is currently managing his own practice working with developers and private clients in and around the Philadelphia area. phia’s annual professional development conference. Nature-based play offers children rich, open-ended, and multisensory experiences playing with nature. One of its hallmarks is “loose parts” like tree stumps, sticks, nuts, and pine cones that let kids build and improvise. Family child care providers in Philadelphia typically have limited outdoor spaces to offer their children. Charrette participants— designers, early child care educators, family child care providers, environmentalists, and others—collaborated on designs for eight prototypical Philly yards to show how simple, small-scale natural elements like grasses, shrubs, birdhouses, a sand pit, or a ring of tree stumps can bring nature-based play to Philly’s back and side yards. SALT Design Studio will turn the ideas and sketches from the October 30 design charrette into a toolkit for use by family child providers and their funders. Romaldo Giurgola, FAIA, who has recently turned 95 and has lived in Australia for the last 33 years, was a key figure in the story of Philadelphia’s mid-century architecture. His notable buildings include the Penn Mutual Insurance Company on Independence Square, the United Fund headquarters on the Parkway, the (now demolished) Liberty Bell Pavilion on Independence Mall, and the Parliament House in Canberra, Australia. A graduate of the Sapienza University of Rome and Columbia, he came to Philadelphia in 1954 to teach at Penn, where, together with the older Louis Kahn and younger Robert Venturi and Denise Scott Brown, he helped to establish what Jan Rowan would call the “Philadelphia School.” But while it was widely recognized that ideas from Philadelphia helped to transform the practice of modern architecture in the 1950s-1970s, these Philadelphians shared only a few general philosophical principles and a handful of stylistic mannerisms. Daniel Kelley, FAIA, came to work with Mitchell/Giurgola in 1980 and is the senior principal at MGA Partners, one of several successor firms. In a wide-ranging interview with David Brownlee in September, he discussed the work of Aldo Giurgola and helped to map the currents of architectural thinking and practice in Philadelphia at that time. DB: When did you first hear of Giurgola, and what did you hear? DK: By 1973, while I was studying at Georgia Tech, I was aware of Kahn’s and Giurgola’s works. From the designs I saw published, it seemed that these men were saying something different about contemporary architecture that was outside of doctrinaire modernism. I imagined that there might be a new relevance, perhaps something more essential, about the work being done in Philadelphia instead of New York or elsewhere. DB: I know you continued your education with an MArch at Harvard, and in 1980 you came to Philadelphia to join your wife, who was studying at the Wharton School. Kahn had died in 1974, leaving Venturi/Scott Brown and Mitchell/Giurgola at the head of your list of top-tier architects. How did you choose? DK: I was a young man who liked to make things, and I had the impression that the Mitchell/Giurgola firm, while having thoughtful and artistic intentions for everything they touched, emphasized architecture as their medium. I was more attracted to that than to the Venturi firm, where I was less likely to appreciate the narratives that accompanied their work. It was thrilling to interview at Mitchell/Giurgola on the 26th floor of PSFS – and I immediately saw them as a cohesive studio that produced sophisticated designs with an integrity that I admired. DK: By and large, we were not compelled towards stylism like that, since Aldo’s principles were strong and the form-making so confident. There was a healthy competition with the Venturi firm at that time (even on the softball field) and we were aware of their successes. However, I recall that we first recognized the real force of Postmodernism in 1981 when Michael Graves won the Portland city hall commission, in a design competition in which we were finalists. DB: What did these very diverse Philadelphians have in common, and how would you define the differences among Kahn, Venturi/Scott Brown and Giurgola? DB: As interested as you were in the alternative spirit of Philadelphia architects, Harvard must have imprinted you with a foundational dose of modernism. DK: Yes, Harvard was thoroughly influenced by Corbusier under the former leadership of Josep-Luis Sert, so plastic formalism was still powerful and contextualism was not. The ritual act of most incoming students was to spend $125 on the seven-volume set of Corbusier’s oeuvre (and I still have mine). DB: So, in Giurgola’s office did you find some of that Le Corbusian form making? DK: Perhaps, but the work wasn’t referential to an aesthetic of form. Instead, it derived from universal ideas of space, context, usefulness, and the elements of architecture informed by discovery. I saw in one person an urbane, rather gentle man whose combination of thoughtfulness, intellectualism, and artistic hand could fluidly guide the work. For me, Giurgola was a wonderful role model. DB: And what did you make of the growing Postmodernist movement, which could be seen as splitting apart the Philadelphia School? DK: What still excites me is that these three constructively challenged the sureness of extended modernism – that of Breuer, SOM, maybe Saarinen– and perhaps even challenged the essentials of Corbusier and Mies, to find a richer, deeper modernism that was connected to other aspects of the human experience besides aetheticism or reductionism. It seems to me that Kahn, Venturi/Scott Brown, and Giurgola accomplished this in different ways. Kahn did it with poetry of place, the presence of materiality as well as an assimilation of classical history and antiquity. Venturi and Scott Brown connected to the emerging power of popular culture and the changes that artists were making in music, two dimensional art, and advertising. Giurgola was consistently interested in the comprehensiveness of place. This meant that his designs often acknowledged and celebrated that they were an episode in a larger order of urbanism or landscape and that their legitimacy lay in their ability to contribute to a cohesive human environment. DB: You seem to be saying that Giurgola and Kahn were most alike among the Philadelphia School, especially in how both believed that one had to design architectural forms in a way that shaped and gave meaning to spaces. DK: Yes. Here you have both Kahn and Giurgola saying “Look at the City and understand that the walls of the buildings are the walls of the streets, and the streets are the conduits of life.” They were saying that there is a complete synthesis between form and space, between interior and exterior, particularly in an urban condition. has broad powers with the language of architecture and he could be very inventive with them in creating form – beyond surface and imbedded in the concept to become a three-dimensional whole. Perhaps this is different from Kahn, where the architecture arose from convictions about space and light. However, what certainly unites the two is that aesthetic ambition or style was not the purpose of their architecture. DB: Drawing played a large role in his form making, didn’t it? DK: He is incredibly proficient in drawing, and this way of communicating his ideas was inspiring to all of us because it was very personal. At that time he drew mostly in pencil and his abilities were extensive – from diagrams, to studies, to the remarkable large renderings that were inevitably so compelling. Drawing is very natural to him and he never seems to labor. Almost like an athlete who doesn’t need to tell his legs to run, he relies on his hand to move independently, to seek shapes and patterns, to find proportion or balance. He visualizes form so well that he can sort ideas three-dimensionally with quick perspectives that lead to solutions about space or about surface. Of all his skill with drawing, it was his ability to synthesize it, in real time with us alongside, as an iterative exploration of design - that was most instructive to me. DB: You’ve said that Giurgola sought to contextualize his buildings and humanize the spaces he made. Could you say more about the limits of his formalism? DK: Yes, because I think to talk of Giurgola only from the perspective of his aesthetic skill is to miss his essential commitment to architecture. He believes that architecture is a vessel for life and the human experience – needing to be, in a word, inhabited. So, he saw as the architect’s primary role to create places that celebrate the possibilities of people and empower them. This quality of place was the starting point for the content of his work, for the design concepts and for the developed buildings including their craft. While he didn’t write prolifically, you will find that he consistently returns to this subject of place in attempting to define the architect’s role as well as his own aspiration. It is difficult to explain the mystery of place and form. For me (and maybe Aldo would agree), it is J.B. Jackson’s proposition that a “sense of place” is embodied in a building with the rhythm of a community in a cyclical course of time and memory. I think that he wanted his work to achieve that. DB: How, then, did Giurgola navigate between his passion for form and his commitments to humanity and architectural context? DK: He considered them as a synthesis, not exclusive of each other – as if form had the ability to reconcile the dynamics of life. Instead of being rigid with ideology, he was able to accept different sources of origin for his designs. He discovered and distilled essential facets of the context and the program, then developed a concept and a formal language of architecture that resolved them. DB: You have a small collection of images here. Can you talk about them? DK: Aldo made many wonderful drawings – happily, they are together at the Kroiz Gallery and Architectural Archives at Penn. He started the process for each project with diagrams that represented simple relationships of movement, space, context, and order. Later, as a concept began to take shape, his diagrams would become more architectural in character. DB: This diagram is of the Penn Mutual Building. What does it show? DK: This is one of his finest early buildings. The diagram illustrates the several essential components that comprise the architecture – and it illustrates his interest in design as a collection of responses, rather than merely being one big idea. It shows the rich north façade that is derived from program and contextual conditions. It also shows the preserved Egyptian Revival façade designed by John Haviland on the north, as well as the east concrete screen that cleverly combines a sun shade, a vertical systems chase, and a structural frame for a free-spanned office space. DB: As the lead designer at MGA, what you have learned from Giurgola? DK: Above all, I would say that I learned a way to work – to make architecture that is a synthesis of ideas and artistic intent. Aldo showed me how to make the act of drawing part of the act of creation – and to have assurance in my power to do that in collaboration with others. Finally, his inventiveness with form, searching each time for the right response, is an affirmation for me of the joy of design. Since we began MGA Partners in 1990 (we have just passed twenty five years), we have assembled a significant portfolio of our own. I am certain that my partners and colleagues share my sentiment that we owe our legacy to Ehrmann Mitchell and Romaldo Giurgola, who found a remarkable firm in 1958 and taught us how to be architects. DB: You’ve told me that sometimes you take out some of Giurgola’s designs to check on how you’re doing, and that a favorite is the unbuilt project for the AIA headquarters in Washington. DK: I bring this image out at least once a year and enjoy it. It is a photograph of the New York Avenue elevation of the firm’s winning entry in 1965 for the competition to build the new national AIA Headquarters in Washington, DC. You might recall that the firm eventually resigned the commission after being asked by review agencies to make too many compromises in the design. Anyway, I am inspired by the façade because it is a glorious act of confidence and compositional power – and it asks me to find some measure of that character in my own work. DK: I would like to return to where we began our conversation, to the special power of Philadelphia as a place that has inspired a community of art, architecture and design for several centuries and given a context for our firm. I would also like to return to Philadelphia as a physical place, with its gracious plan, its earnest buildings expressing the craft of architecture, and its spaces measured by time – all a framework for achieving meaning in our work. The fact that these ideas are so beautifully accessible in Philadelphia binds our work inevitably to this place. Giurgola and the other men and women of the Philadelphia School conveyed this character to us in a burst of energy a half century ago, and that is why we remember them and honor their work. Finally, I want to say again that Aldo is a natural maker of beautiful things. To be connected with such excellence is a magnificent pleasure. He is elderly now, so his correspondence is occasional. However, he has taken to ending his short letters with a benediction that I offer all architects as we conclude: “More power to you.” ■ Daniel Kelley is a partner in MGA Partners. William Whitaker is curator and collections manager of the Kroiz Gallery and Architectural Archives of the University of Pennsylvania. once surmounted the Pep Boy’s store on North Broad Street recall the monumental, allegorical sculptures of nineteenth century civic buildings. The comparison with City Hall’s iconic William Penn statue (located a short distance away and within sight), while amusing, is also indicative of the borrowing that is a central characteristic of commercial architecture. The line between high civic aspirations and the everyday banter of Main Street is wonderfully blurred. These examples of everyday modernism in Philadelphia are every bit as interesting as those found, more expectedly, in the car-centered cities of the American West – however tempered ours might be by the local historic context and the realities of icy winters. In fact, our historic context makes the juxtapositions between new and old more complex and interesting. But this is the Quaker City, and restraint and social concern are also expressed in this architecture, particularly in the city’s community health centers and branch libraries. The Philadelphia Senior Center at Broad and Pine (by Joe Jordan, with landscape architect Harriet Pattison, 1979) and District Health Center #1, across the way (by Montgomery & Bishop, architects, 1959), demand a second look, not only for their engaging architectural detail but especially because of this city’s long history of expressing medical achievement through art. conceit of Fallingwater. On the former Waterman estate, local developers Erney and Nolen constructed a series of fairly traditional, one-story, Colonial Revival dwellings typical of many houses of the period. But next to them on Valley View Road, John Nolen, Jr., the in-house architect for his father’s company, completed a more daring residence for himself in 1950-51, with a butterfly roof and recessed walkway entrance. Nolen, in his later partnership with Herbert Swinburne, completed several other nearby modernist houses, clad in tan brick. The most significant modernist complex of the 1950s in Chestnut Hill is Cherokee Village, the work of Oskar Stonorov, and an exemplification of his ideas about “group housing.” This 104-unit garden apartment and townhouse project, with efficient apartment plans that function like Swiss watches, was built in two phases in 1950-1955. (The second portion is by the firm of Stonorov and Haws.) The client was Donald Dodge, a Houston relative, and the project was constructed on a former Houston family estate, carefully incorporating mature trees and other landscape features. The design, which emphasized another traditional local building material, brick, was covered by gabled roofs. Robert Venturi worked in the Stonorov office during the project. In addition to its low-rise apartment buildings, the “Village” also included single houses on an adjacent street. The 1960s brought a group of internationally important, Philadelphia-based designers, all key figures in the “Philadelphia School,” to Chestnut Hill, where they built three remarkable houses for single women clients. Robert Venturi’s design for his mother Vanna, built 1959-1962, sparked a world-wide architectural revolution, yet it sits comfortably in its Millman Street context, where its polemically “ordinary” gabled roof, prominent chimney, stuccoed exterior, and small scale relate to the form and materials of neighboring mid-nineteenth century dwellings, and also to the nearby 1920s Woodward development houses and Kenneth Day’s Charles Woodward House. The Margaret Esherick House, designed by Louis I. Kahn in 1959-61, is just down the street, and it, too, plays the role of a good neighbor, with tan stuccoed walls and a traditional emphasis on masonry mass and weight that was equally revolutionary when compared to modernism’s usual industrial materials and lightweight construction. The house that Dorothy Shipley White commissioned from Mitchell/Giurgola, completed in 1963 near the Chestnut Hill golf course, follows in the same vein in its stuccoed surfaces, but comes closest to the more conventional modernist vocabulary in its asymmetrically disposed, flat-roofed, rectilinear volumes. Updating the Chestnut Hill Historic District cannot yet come closer to our own time than this astonishing triumvirate of the 1960s, because of the 50-year cut-off. It is notable, however, that Philadelphia architects continued to design important modern projects in Chestnut Hill, including Rafael Villamil, the late Mark Ueland, John Rauch, and others. More recent work by Lawrence McEwen, Runyan and Associates, and Elie-Antoine Atallah indicate that the tradition of good modern design continues to flourish in this section of the city. ■ Emily T. Cooperman is a historic preservation consultant who is now participating in the updating of the Chestnut Hill National Historic District nomination. ups and downs of this attitude. But I can certainly say that, no one in the project team any longer sees what Penn is doing at Richards as a mere rehabilitation project. There has been a palpable and growing understanding of the meaning and legitimacy of the National Historic Landmark designation and its associated stewardship responsibilities. (A small but meaningful contribution to this evolving attitude was a lunchtime pizza conversation that David Brownlee and I had the pleasure of conducting with the construction personnel, telling them what a National Historic Landmark is, and why Richards is one.) But an even more powerful educational force – no surprise – is the building itself, which has a remarkable ability to convey, through some form of mute architectural sign language, how it needs to be treated – just what kinds of intervention and alteration are – and are not– appropriate. I sense that the entire team is now receiving those mute instructions and advice from the building, no matter what their attitude about it was when the project began. And as the building is gradually freed from unsympathetic alterations, in a process that will continue for several years, I expect an ever larger circle of those who experience the Richards Building will begin to hear those messages. ■ David Hollenberg is the University Architect of the University of Pennsylvania. DESIGN AWARDS The John Frederick Harbeson Award is presented annually to a long-standing member of the architectural community and is intended to recognize significant contributions to the architectural profession made over their lifetime. alan greenberger and aia Philadelphia board members troy hannigan, assoc. aia, Soha St. Juste, aia, and Jim rowe, aia pose with the honorable Michael nutter as he receives the cret award. The Paul Philippe Cret Award recognizes individuals or organizations who are not architects but who have made an outstanding and lasting contribution to the design of buildings, structures, landscapes, and the public realm of Greater Philadelphia. The Honorable Michael Nutter, Mayor of Philadelphia – Since Mayor Nutter took office in 2008, he has been committed to improving Philadelphia’s built environment, pledging to make Philadelphia the Number One Green City in America. With the support of the local architectural and building community, Mayor Nutter has had some notable successes. “From the Greenworks Philadelphia initiative to the redesign of Dilworth and Love Parks, and the redevelopment of Market East and North Broad, Mayor Nutter has fostered an environment that promotes the role of architecture in a thriving world class city”, said Jim Rowe, president of AIA Philadelphia. The Young Architect Award, presented by AIA Philadelphia’s Steering Committee of Fellows, seeks to recognize a candidate’s contribution to the categories of leadership, practice and service. Fon S. Wang, AIA, LEED AP, Director of Historic Preservation at Ballinger – Ms. Wang’s professional expertise stems from a broad range of practical experience in the field of architectural design and historic preservation. Her impressive portfolio ranges from new construction to adaptive reuse and historic preservation for commercial institutional and residential clients. She is a Board Member for the Preservation Alliance of Greater Philadelphia, Co-chair of Community Outreach Committee for CREW Philadelphia and volunteers her professional design services for the Community Design Collaborative. fon S. Wang, aia, leed aP, receives the young architect award from committee co-chair, Mary denadai, faia. The Community Design Award, presented every year by the Community Design Collaborative, recognizes one of its many compelling Design Grants for excellence in design, collaboration, and community impact with its Community design Award. KieranTimberlake “a truly civic project that is inclusive and allows for many types of people to coexist happily and in a very calm way.” – 2015 design awards jury Originally built in the 1970s as part of an urban renewal initiative, the earlier design for Dilworth Park was plagued by hard surfaces, walls, barriers and inexplicable changes in elevation. The renovation of Dilworth Park restores its stature as a place of great civic engagement, while bringing the urban infrastructure of its transportation network into the modern day. The new park reinforces the center of William Penn’s original plan for Philadelphia as a place where people from diverse backgrounds are welcome to convene, observe, and enjoy the vitality of the city. Digsau “the innovative use of existing materials on site really made this project stand out.” – 2015 design awards jury This facility—dedicated to wellness, fitness, and theater—helps to revitalize the south side of the Swarthmore College campus and serves as a gateway to the athletic facilities. An extensive example of building recycling and reuse, the project goals of environmental stewardship and a progressive contextual design are reinforced through the deployment of the building’s materials. The building reuses the footprint of a former squash court building, including the original concrete foundation, slab, and retaining walls. The first floor façade was repurposed from overstock and scrap stone from several previous campus projects, including the College’s oldest buildings. Using input from the masons and a series of mockups, a system was developed for categorizing and cutting the stone. Wall construction was guided by a set of rules and key dimensions that described the architectural intent and allowed the intuition and artistry of the mason to resolve the detail. Your Vision. BUT You Got This. We can achieve your vision.